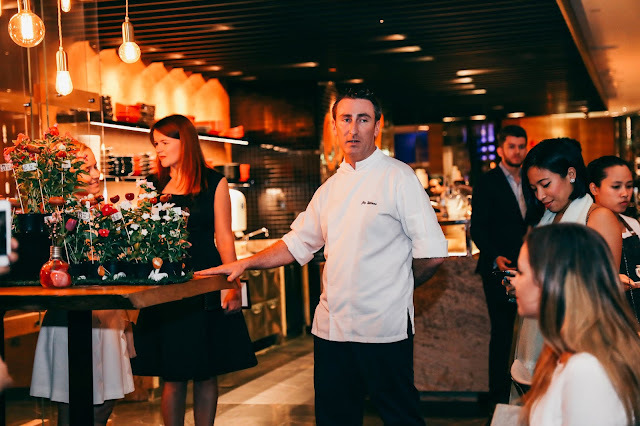 There were some fantastic new offerings that really stood out for me- the Tandoori duck, and watermelon salad and the Masala roast black cod are just two of those dishes that wowed me. The Garam masala brûlée dessert too was amazing. 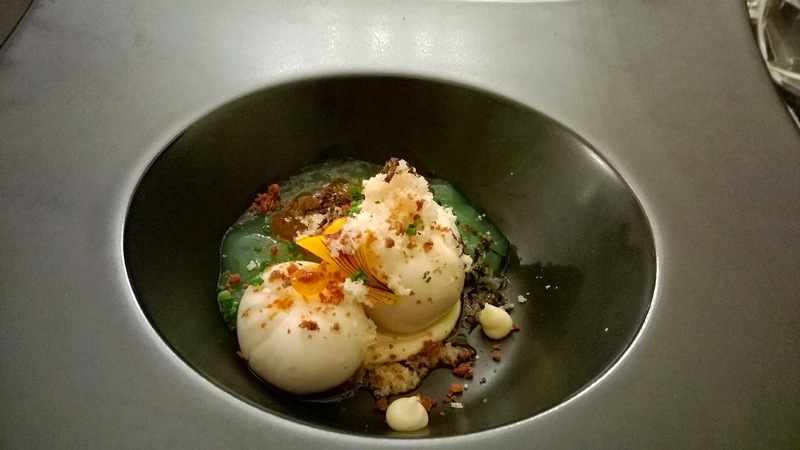 However, the Scallop moilee was again one of the dishes of the night. It was virtually unchanged, except for less tomato salsa than the last time, but essentially the same dish. It is a testament to the popularity of this dish that it has retained its original form and ingredients. Changing this dish would be like asking Monet to use sunflowers next time instead of water lilies. Sacrilege. It is a pretty looking dish. A dark plate serves as the contrast for everything else on the plate. A bamboo leaf has two mounds of unrefined sea salt at opposite ends on the bamboo leaf. 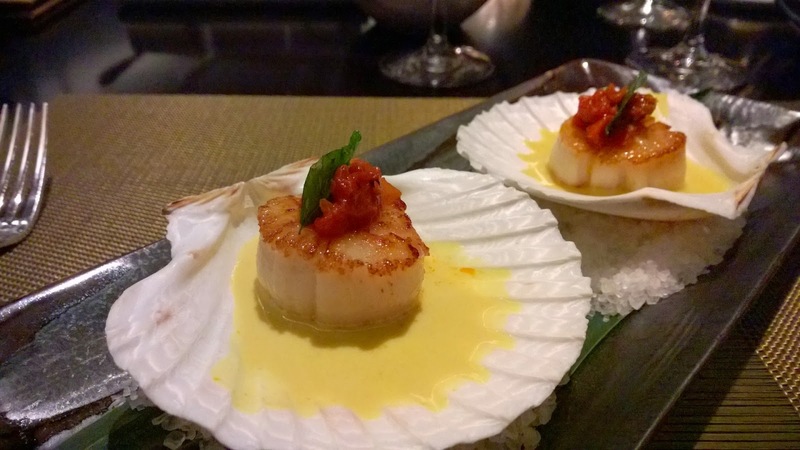 Two large scallop shells act as the smaller plates for the flavoursome sauce made from coconut and ginger. The gorgeous yellow colour comes courtesy of tumeric which is added. There is a lightly sautéed scallop in each shell, touching the sauce. The scallops contribute to the contrast in themselves with the sautéed surface a golden brown colour, juxtaposed with the still-white part of the rest of the scallop. 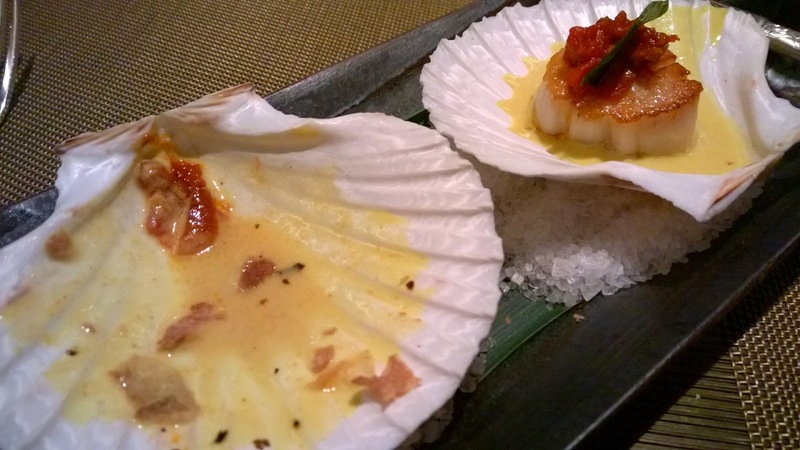 Next, the tomato salsa sits atop the scallop with a curry leaf rounding off everything. There is a sense of harmony in the presentation. While the colours are contrasting, they are not harsh contrasts. Even the tomato red is not a discordant red. The yellow, too, seems muted, but still sensuous. Notwithstanding the variety of tastes on the shell, it is still quite subtle and delicate. The richness in flavour though is undeniable. Scallops, as you know, are quite tasteless, with no obvious taste reference to the sea. Try it on its own, and then with the salsa. The scallops are soon gone, but not the sauce. I take a piece of plain naan and dip it in the sauce. No time for fine dining etiquette here. This is about tasting. About having the last bit of a marvelous dish. 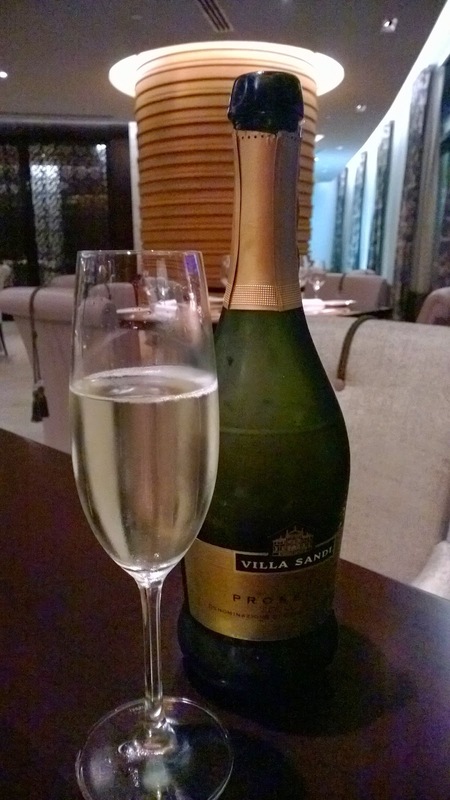 The paired wine for the occasion is the Villa Sandi Prosecco. It is uncomplicated with a lovely yellow straw colour. Great mousse. Citrusy. It is a perfect wine to accompany the scallops. 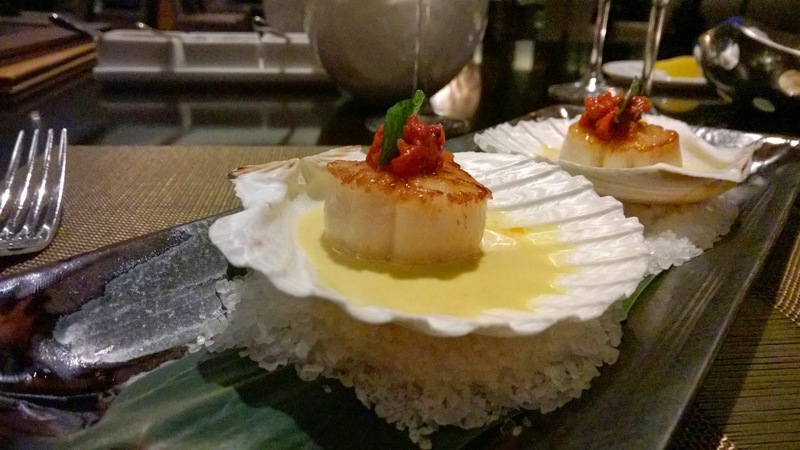 Scallops served in a shell is not new, but if you have never seen it, it has quite a novelty aspect. But the Scallop Moilee is exceptional for reasons which transcend the presentation. It is a tremendous dish for reasons other than the light flavours in the context of Indian cuisine. It is ultimately about a chef who through his skill is able to create a vision of bringing together cuisines and staying true to it, while at the same time remaining in touch with his cultural heritage. It is about making magic in the kitchen and leaving the audience at the table gasping in awe. Life is beautiful.